Osvaldo Pinali Doederlein has done another JavaFX 2.0 benchmark using the commonly favoured bubblemark animation test. As always, his findings are in-depth and well worth reading. Daniel Zwolenski (aka Zonski) has put up an early access release of his JFX Flow project. You can find the blog post announcing it here, the project site here, and the Google project here. Mark Stephens put up a teaser about a project he is working on to enable rendering PDF files inside JavaFX using the JavaFX scenegraph. Pedro Duque Vieira has put up some simple util methods to convert to and from BufferedImage in JavaFX. Just a word of warning: this uses impl_* methods. Rob Mayhew has blogged about showing fading status messages in JavaFX 2.0. Carl Dea has announced a book he is releasing through Apress in December titled “JavaFX 2.0: Introduction By Example“. Enrique García has a sample application showing JavaFX integration with Phys2D. Speaking of physics, Bertrand Goetzmann has put up the Groovy source code for the Grezi physics demo (which uses JBox2D, another physics library). You can also watch a video of it. Gail Anderson has blogged about the importance of JavaFX properties. This week Johan Vos and I put out a slight revision to the DataFX project, pushing it up to 0.0.4. This release includes increased CSS styling support for table rows, as well as early OSGi deployment support. Welcome to another week! 🙂 There is a heap of good links this week – it seems the quality of blog posts is certainly increasing these days! Keep it up folks 🙂 As always, I hope you enjoy some of the links below, and always feel free to email me links to include. I mentioned last week that the ThingsFX Swing-in-JavaFX project didn’t support key events, but that it was coming soon. In actual fact, I was wrong – it is already supported. Speaking of ThingsFX, one of the members of that team, Roman Kennke, blogged elsewhere about the Swing in JavaFX integration, and even put up a demo applet that shows the current implementation. As you’ll note, it is a little slow, but it shows a lot of promise once faster options are made available. Tom Schindl has released e(fx)clipse 0.0.8, and now e(fx)clipse also has an official website. This project is very exciting, so if you are an eclipse user and want top-notch JavaFX tooling support, you should check this out and provide feedback. Zonski continues blogging about his research and development with JavaFX 2.0. This week he talks about file downloading in JavaFX 2.0 (over HTTP). Johan Vos has blogged about visualizing REST XML data in JavaFX controls, making use of the DataFX project. Tom Eugelink follows up his JavaFX 2.0 bubblemark explorations after being told of a runtime switch for JavaFX 2.0 that removes the 60fps limit that JavaFX imposes. The slide deck that Stephen Chin and Peter Pilgrim used at Devoxx 2011 for their “JavaFX 2.0 – A Developer’s Guide” session is available online for those interested. Patrick Champion blogged about extending a JavaFX 2.0 control to add functionality. I should probably add that their are simpler ways to doing this in many cases, which I covered in a JavaOne talk called “Custom UI Controls and Charts with JavaFX 2.0“. Andre Hogenkamp has posted a second blog post about running JavaFX 2.0 in Linux (whilst awaiting official support from Oracle). Scott Hommel has blogged about using the JavaFX Screen API to determine the dimensions of the users screen. Eric Bruno blogged about JavaFX 2.0 binding APIs. Whilst it is a good blog to cover the main concepts of binding in JavaFX, it skips over some simpler options that are possible for the specific use case mentioned in the post. For example, rather than bind the TableView width/height to the scene width/height properties (and place them inside a Group layout), if a StackPane is used instead the TableView will grow automatically without needing any bindings. Similarly, some controls have their max width/height set to the pref width/height, so it is simply a matter of calling, say, button.setMaxHeight(Double.MAX_VALUE) to have them grow automatically when placed in a relevant layout. Keep up the great work folks. Catch you all in a weeks time. Kai Tödter has blogged about ‘Eclipse 4.x RCP + JavaFX Renderer‘. Of particular interest is the three screenshots, that show quite different styling in JavaFX that is achieved with minimal changes to the CSS. Mario Torre did a quick status update blog post about the work he and his colleagues are doing to allow for Swing to be embedded within a JavaFX scene. The latest post indicates that they now have proper focus support, and that they are next planning on adding keyboard events. In a separate post, Mario showed a small demo application he created that shows JavaFX creating 3D scenes (in the sense that you’ll need 3D glasses to see the effect). Roman Kennke created a HyperTree renderer in JavaFX. Both the source code, and a live demo, are available for your viewing pleasure. Niklas Hofmann has put up a PDF detailing the JavaFX properties and binding API. Rob Mayhew has blogged about JavaFX 2.0 layout using MigLayout / MigPane. Tom Eugelink has ported the bubblemark benchmark to JavaFX 2.0, and has some interesting findings. Lawrence McAlpin has blogged about ‘cooler javaFX kreations‘, which demonstrates use of animation, controls and FXML. Andre Hogenkamp has blogged about a (hacky) way of getting JavaFX 2.0 to work in Linux, whilst the official support is still forthcoming. It involves using Wine, and obviously has limitations. Bertrand Goetzmann has put up another video showcasing his Grezi application, this time making use of GraphViz to lay out nodes in the scene. Johan Vos and I put up a new release of DataFX, taking the release version to 0.0.3. This release has updated RedFX support, as well as the TableViewFactory class that can help auto-configure a TableView for you. I plan to continue to improve this class as time allows, as it is very minimal right now. Continuing on from last weeks mention of the OpenJFX project being ‘formally discussed’, it has now been formally proposed as an OpenJDK project. Voting is currently underway, with voting closing on November 16. Following this, if everything goes to plan, the first release of JavaFX source code (the UI controls library) will follow shortly thereafter. A new JavaFX 2.0 Mac OS Developer Preview release came out last week, taking the build number up to 07. The ThingsFX project was launched this week by Robert Branchat, Mario Torre, and Roman Kennke. This project is the new home of the link I blogged about last week where they have enabled embedding Swing inside JavaFX (the opposite of what is supported natively in JavaFX). They also put up a few blogs about this feature. Firstly, they demonstrated embedding a Swing button inside JavaFX, then JFreeChart inside JavaFX, and finally an image processing example. Tori Wieldt, blogging for The Java Source, has blogged on the topic of ‘What is JavaFX?‘. Of particular interest to many, she links to a number of upcoming talks at various conferences. 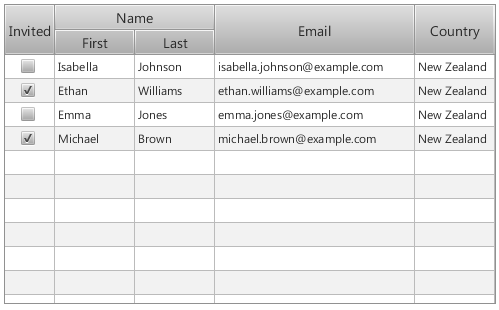 FXForm2, a dynamic JavaFX 2.0 form generation library, has been updated. Zonski continues his explorations of JavaFX with FXML in a blog post titled ‘Client Server with JavaFX 2 and Hessian (+Guice +FXML)‘. Wayne Young has a post about configuring JDeveloper for JavaFX 2.0 development. Gail Anderson continues her series of blog posts, this week her post covers adding animation with JavaFX. Peter Pilgrim has put online a video walkthrough of using ScalaFX. Narayan has blogged about a way to enable saving a JavaFX node or scene to an image file.